As you know, I’m moving this month. In preparation for this I did a massive closet clean out in March and I literally cut my wardrobe in half and donated it. Awesome, right? Not so. I was disgusted after I was finished. My closet, dresser and hampers were still overflowing and I had given away SO MUCH. Much of which I still liked, that was practically new, and that I’d spent a lot of money on. I looked at that massive pile and saw easily $2000 worth of clothes and shoes staring back at me that I’d barely worn and was now giving away. It was a huge reality check for me and I’ve been pondering how to get a handle on the situation ever since. We are moving into a condo and while we have decent storage space, I am not interested in cramming it full of more clothes I never wear. Let’s be real. I’m an indecisive person and I’ve started to feel like having all of those choices isn’t doing me any favors. If I really delve into my closet, I’m finding mostly things I either forgot I had, don’t wear but paid a lot for so I feel bad getting rid of them and things that only after alterations will be wearable. It’s no secret to anyone who knows me: I love to shop. I am on about 49,281 email lists and I’m beginning to realize that it’s detrimental to my closet and my wallet. I see a 50% off sale in my inbox and I am instantly interested, even if I don’t need or want anything. This usually leads to me settling on a piece just because it was on sale. Don’t even get me started on online shopping. When I look in my closet I could point out a ton of pieces that were purchased online and weren’t exactly right but I didn’t want to deal with shipping them back so I kept them. Now they only serve the purpose of making me feel guilty when I look in my closet. I’m beginning to realize that shopping is more of a fun rush for me than anything else, and I want to take my power back a bit. I’m tired of throwing my hard earned money down the drain and being surrounded by stuff, all the while still feeling like I have nothing to wear. I was reading a magazine last week and stumbled upon a “10 Pieces, 30 Outfits” feature. I’ve noticed these a million times and am always attracted to the concept. The spread was beautiful. It showed 10 basic pieces you should already have in your closet and 10 fresh new pieces of the season. The next pages featured a smiling woman in all of the different outfits, 30 in all, each looking very different from the last. It inspired me. I’ve been seeing a ton of different takes on capsule wardrobes and have done a lot of pondering on if I could make one work. They all have similar premises, with flexibility to suit yourself, of course. One capsule is to last three months. You have around 30-40 pieces to mix and match for that three months and you do not shop until the end of the three months when planning your next capsule. After a lot of googling I stumbled on Un-fancy, a site based around the blogger’s capsule wardrobe. She even has a free planner on her site to get started. On a whim, I filled it out and realized that not only could I make it work, with us moving right away now is the perfect time. For the time being, I’m going to donate even more stuff. I’m going to see those less than stellar purchases as learning opportunities and send them on their way. I’m not willing to hold on to anything that makes me feel bad anymore. It’s time for a fresh start! Go through EVERYTHING I currently have and be tough on each piece. Ask the hard questions. Get rid of anything that I am waffling about. Any seasonal items get stored out of sight. I can choose up to 30 pieces. These do not include: shoes, accessories, underwear, pajamas, workout clothes, swim wear or formal wear, although those will be significantly weeded out. Shoes are usually included in the pieces in other capsules I’ve seen, but truthfully, I’m not much of a shoe gal and I don’t even have that many, especially after my massive closet clean out. I also was willing to choose less clothing pieces to keep my shoe options open. I can buy one clothing item a month, but I have to really LOVE it. I’m easing into the whole no shopping for three months thing. Baby steps. Bonus: If I do not buy an item that month, I get a small reward not related to clothing. It has to be an experience that contributes to joy like a movie date or a pedicure. It can’t be a “thing”. That said, I am unsubscribing to all shopping emails to avoid temptation. I am in the process of choosing my pieces now and will report back once I’ve decided on them! 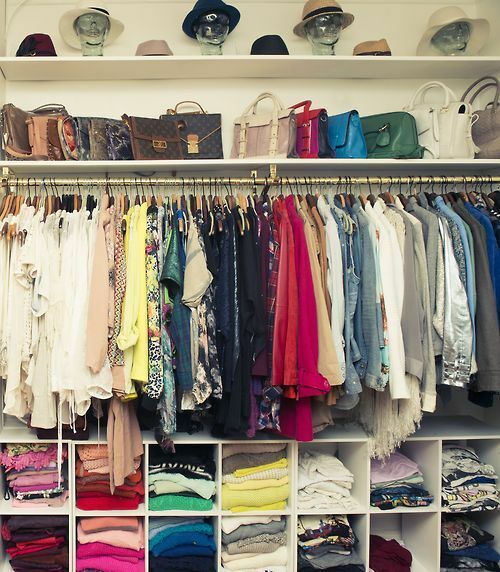 I love the idea of capsule wardrobes, and use one myself. I like the idea of having a few really great, versatile items that make you feel and look great, other than a bunch of stuff that’s just okay. It’s just makes every outing so much easier. I agree with how easy it makes things, I have been loving it so far! It’s amazing how I feel like I have more with less. Thanks for reading!